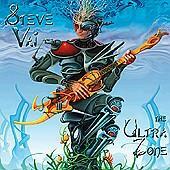 You can trust Steve Vai not to come with a run-of-the-mill shred album. I mean, has he ever? Mr. Space Age Guitar himself may have disappointed a few people when "Passion and Warfare" didn't turn out as berzerkedly insane as "Flex-able". Or, for that matter, when his later albums weren't again the full-instrumental aural onslaught that "Passion and Warfare" was. Though always recognizable, none of his albums ever sounded like anything that came before (barring perhaps a certain Zappa element which, as far as I'm concerned, is always welcome). Main new ingredient on "The Ultra Zone" - an ingredient that no doubt some won't like, and some will - is the use of sample CDs. Quite a few of the instrumental tracks have Vai playing guitar to Asian singing (from a sample CD) or pretty funky drum loops (again from sample CDs). So far I've always associated samples with hip-hop and house music, where musicians basically can't do anything themselves and therefore resort to ripping sounds or beats from people who've actually succeeded in creating them, sometimes long before they were ever around. Vai, however, uses them fairly and to interesting additional effect. In the opener, "The Blood & Tears", for example, the Asian female singing adds a hauntingly eerie extra sonic layer. In this way, 6 of the 14 tracks were produced. They don't sound clinical or hollow or ripped off. They, in fact, sound very rich. Steve Vai can't just play the guitar amazingly well, and can't just write intricately good tunes, he also knows how to bend the possibilities of today's musical technology to his best advantage. "The Ultra Zone" is an album that is at times beautiful, at times technically amazing, sometimes sensitive ("Frank", for example, a ballad type track dedicated to his mentor Frank Zappa), but especially fascinating from beginning to end. The only thing that bugs me is that there seems to be a smurf singing on several of the tracks. Oh yeah...cover artist Aaron Brown does a mean Roger Dean!